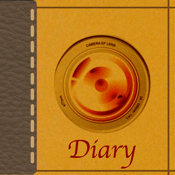 Photograph diary is a simple diary application which attaches and records the comment on the photograph taken with the camera. It can classify according to the unit of an album like "recollections of a travel", and "the life list of the cultivated plant." It is recordable any number of times on the first. (1) Since it will move to an album creation screen if the tap of the upper right "+" button is carried out, please entry a title and photo a cover (it is possible also from a camera roll), and carry out the tap of the "Make" button. (2) If the tap of the created album is carried out, it will move to the page list screen. Since it will move to the page creation screen if the tap of the upper right "+" button is carried out, please make page from the same way as an album. (3) If the tap of page which created is carried out, page edit, the expansion display of a photograph, and the display of a photography place which were reflected in the detailed screen and made can be given. If the tap of the camera button in the lower right of a page detailed screen is carried out, a photograph can be taken displaying thinly the photograph currently then displayed and comparing it. The grid for photography assistance can also be displayed from the slider displayed to carry out the tap of the Setting button. * about the other operation methods. -> a deletion alert will be displayed if long aggressiveness an album to delete . If "yes" is chosen here All page in an album and an album is deleted. -> Please turn Flick of the cell of a page to delete sideways in a page list screen. Since it is asked whether I may delete if the tap of the displayed deletion button is carried out, please choose "yes", when satisfactory. - Display the detailed information of an album. -> If the tap of the "info" button in an album list screen is carried out, a creation date, a last update date, page information, etc. will be displayed. In order to close this screen, please carry out the tap of somewhere in info screens. -> if the tap of the setting (gear) button in an album list screen is carried out, it will move to a setting screen. Here, change of a display theme, the existence of camera assistance, etc. can be set up.